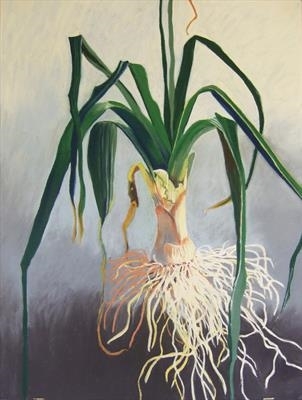 A portrait of a leek drawn in soft pastel on Somerset paper. The vegetable is shown complete with its roots against a blue/grey ground. This is one of a series of drawings celebrating the produce of the artist's allotment and vegetable garden. These portraits of vegetables show each food plant in its entirety - complete with roots and blemishes. The pastel captures the textures and colours of the vegetables, allowing the viewer to take time to appreciate the various individuals that contribute to our diet.